The Flatiron Club, just outside Knoxville, offers support groups for addiction multiple times a week. For many in long-term recovery from addiction, these groups are their primary resource. Tucked between a barber shop and an antiques store along a dark highway into Knoxville, Tenn., the Flatiron Club is easy to miss driving by at night. Its only announcement, completely invisible in the dark, is a small, unlit sign above the door. Inside, two older men and a woman holding a Styrofoam cup loiter in the fluorescent-lit space. A nearby folding table and chairs sit unused. A young man, thick-armed in a tight black shirt, walks in. “Sorry,” an older man tells him, “the meeting’s been canceled — the organizers got sick; no one came.” Then he pauses to reconsider. “Pull up a chair,” he says. Seated around the table meant for a much larger group, the four are quiet at first. The young man, though he’s normally reserved, begins to speak. Then the room, white and sterile-looking, comes alive with stories of struggle and redemption. David Wilson, a 27-year-old from a struggling community on the Kentucky border, is one of the 1.7 million people in the United States with an opioid abuse disorder, as estimated by the American Addiction Centers. Clean now for nearly three years, Wilson tries to attend at least four meetings a week, more than his halfway house requires. And while the meeting at the Flatiron Club is not even for opioids — it’s technically a Crystal Meth Anonymous group — there is an understanding among the recovery community that the actual drug doesn’t matter, as long as you’re attending meetings. And you’d better be attending meetings. For years, those wading through the long process of addiction have found relief in support groups based on the 12-step Alcoholics Anonymous program. “The therapeutic value of one addict helping another is without parallel,” goes an often-repeated line from the Narcotics Anonymous handbook. But there’s another reason these discussion groups play such a central role. Few other resources are available at all for those in long-term recovery. While public awareness about addiction has grown in recent years as the opioid crisis deepened, the solutions offered by policymakers and nonprofits are often weighted toward what is, for many addiction stories, only the opening act. To try to stop addiction before it happens, 15 states stretching from Utah to South Carolina have placed strict limits on painkiller prescriptions. High school educational drives are intended to warn students away from abuse. And for those in the throes of addiction, emergency services have begun to stockpile naloxone, an overdose-reversing drug. But for everything that comes after the active addiction, attention and funding peter out. The continuing stigma surrounding addiction is a large impediment, says Steve Wildsmith, a recovery advocate in the marketing department of Cornerstone of Recovery, an intensive residency program in Louisville. While many states have laws mandating that insurance plans include addiction-treatment coverage, the majority will pay “at most” for 28-day rehab programs, Wildsmith says. Physical healing of the brain takes much longer — up to 10 years for sustained remission, according to 2017 statistics from the National Institutes of Health. Meanwhile, about 4 percent of the opioid-addicted population dies annually of overdoses. But this approach is beginning to change. “There’s been a growing realization that this is a lifelong, chronic disease,” said Karen Pershing, executive director of the Metro Drug Coalition, an anti-addiction nonprofit partially funded by the city of Knoxville. As data continues to show a worsening crisis, groups like the American Psychiatric Association have adapted. In 2013, the APA updated the DSM, the standard diagnostic manual for clinicians of mental disorders, to convey the new understanding of addiction as chronic and those who suffer from it prone to relapse. Solutions have begun to follow suit. Massachusetts’ 2018 opioid legislative package, signed by Gov. Charlie Baker at the STEPRox Recovery Support Center in Boston, focuses the bulk of its efforts on improving access to treatment and expanding the role of recovery coaches. It creates new pathways connecting hospital emergency rooms to inpatient treatment programs, creates a commission studying the efficacy of these programs and lays the groundwork for pilot programs in five corrections facilities across the state to offer medication-assisted treatment. In Minnesota, initiatives like the Minnesota Recovery Corps, a new offshoot of the national service organization AmeriCorps, recruits volunteers to be “recovery navigators.” These navigators — often drawing from their own experiences with the disease — mentor those working to overcome opioid addiction and help them find resources. A lingering problem facing many efforts to help those in recovery, such as assistance with housing or re-acquiring a driver’s license, is that they are scattered, Pershing said. “Right now, you just have to try to find them on your own,” she said. Her organization is seeking to create a resource recovery center to centralize this kind of information. They are taking notes from longtime existing facilities like the Council on Recovery in Houston, which not only gathers many recovery services under one umbrella, but connects clients and walk-ins to available outside resources, as well. In some areas, local governments are leading the charge. Blount County, just south of Knoxville, has, in recent years, put increasing emphasis on its Recovery Court program (recently renamed from Drug Court), which diverts drug offenders from the jail into a strictly regimented curriculum to get them clean. For many in the program, it is the first help from mental health professionals they have ever received. Blount County Judge Tammy Harrington said she has seen even hardened, long-term offenders emerge with a lasting grip on sobriety. Daniel McQueen, who had been in and out of jail many times but is now “addicted to recovery,” with dreams to establish a recovery center of his own, is just one example. While addiction is a powerful disease, it is not damning. Living proof is found in the recovery stories of those like Christopher Russell, who after years spent in the deepest pits of addiction following a traumatic childhood, is now working toward a bachelor’s degree in counseling psychology. Pam Spindel spent years on the street, but in February earned a pardon from the Tennessee governor for her addiction-related crimes. Steve Wildsmith became an award-winning newspaper columnist. Today, all three work at Cornerstone of Recovery, helping those still early in their recovery process. And the victories from sobriety also come in much simpler forms. Just ask Wilson, the young man at the Flatiron Club meeting. “I’m the happiest I’ve been in my entire life,” he says. 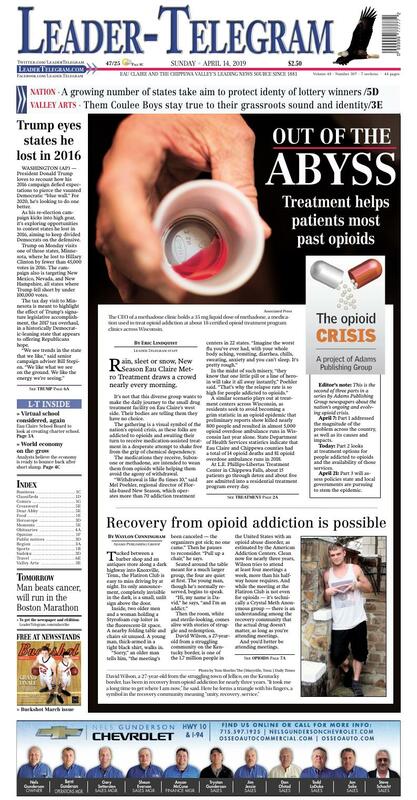 Editor's note: This is the second of three parts in a series by Adams Publishing Group newspapers about the nation's ongoing and evolving opioid crisis. April 7: Part 1 addressed the magnitude of the problem across the country, as well as its causes and impacts. Today: Part 2 looks at treatment options for people addicted to opioids and the availability of those services. April 21: Part 3 will assess policies state and local governments are pursuing to stem the epidemic. The CEO of a methadone clinic holds a 35 mg liquid dose of methadone, a medication used to treat opioid addiction at about 18 certified opioid treatment program clinics across Wisconsin. John VanDeVoort, pharmacy director at HSHS Sacred Heart and St. Joseph’s Hospitals, sorts medications at the St. Joseph’s Hospital pharmacy in Chippewa Falls. Among the medications the pharmacy dispenses are Vivitrol and Suboxone, which are used to treat opioid addiction. Nearly 400,000 U.S. residents died from opioid-related causes from 1999 through 2017, according to the U.S. Centers for Disease Control and Prevention. Rain, sleet or snow, New Season Eau Claire Metro Treatment draws a crowd nearly every morning. It’s not that this diverse group wants to make the daily journey to the small drug treatment facility on Eau Claire’s west side. Their bodies are telling them they have no choice. The gathering is a visual symbol of the nation’s opioid crisis, as these folks are addicted to opioids and awaiting their turn to receive medication-assisted treatment in a desperate attempt to shake free from the grip of chemical dependency. The medications they receive, Suboxone or methadone, are intended to wean them from opioids while helping them avoid the agony of withdrawal. A similar scenario plays out at treatment centers across Wisconsin, as residents seek to avoid becoming a grim statistic in an opioid epidemic that preliminary reports show killed nearly 800 people and resulted in almost 5,000 opioid overdose ambulance runs in Wisconsin last year alone. State Department of Health Services statistics indicate that Eau Claire and Chippewa counties had a total of 14 opioid deaths and 81 opioid overdose ambulance runs in 2018. At L.E. Phillips-Libertas Treatment Center in Chippewa Falls, about 15 patients go through detox and about five are admitted into a residential treatment program every day. When Toni Simonson joined the center, a service of HSHS St. Joseph’s Hospital, three years ago, about half of the detox patients were for alcohol and a quarter for opioids. Those shares since have reversed, she said. That leaves a lot of Chippewa Valley residents from all walks of life fighting to vanquish an addiction, one that for many starts with a painkiller prescription from their doctor or dentist and progresses to using illicit narcotics, heroin or even more potent synthetic opioids such as fentanyl. Its widespread nature is part of the challenge of fighting the opioid epidemic. Paul Krupski, director of opioid initiatives for DHS, acknowledged that Wisconsin, like other states, has been more reactive than proactive in its response. “It’s an epidemic we had to catch up to,” Krupski said, because so many people were dying from opioid overdoses. To that end, the department’s primary mission in the fight against opioid addiction is pretty basic: “Our overall goal is to reduce the number of opioid-related deaths in Wisconsin. We need to save lives,” Krupski said. DHS officials hope to accomplish that directly by increasing the availability of naloxone, the overdose reversal medication commonly known by the brand name Narcan, and also by advancing prevention strategies and increasing access to treatment and retention of patients in treatment programs. In 2015, the state opened treatment program offices in Ashland, Minocqua and Marinette to help address a shortage of services in northern Wisconsin. The state’s 18 opioid treatment programs served 10,626 people in 2017, up 70 percent from 2013, Krupski said. DHS since received federal funding to open five additional treatment facilities around the state, including Arbor Place in Menomonie, which primarily serves patients in Dunn, Pierce and St. Croix counties. Despite those expansions, he acknowledged there isn’t enough access to treatment available statewide or nationwide, and thus a majority of people who need opioid addiction treatment are not receiving it. Krupski offered the example of a person addicted to opioids who lives in Hayward and for whom daily doses of methadone might be the best treatment. The problem is the nearest place for that individual to receive the treatment is Eau Claire. “It’s just not realistic,” he said, citing the hurdles of making such a drive every day while juggling careers, families and an addiction. Both L.E. Phillips and New Season reported that they attract patients from within about a 90-mile radius of Eau Claire. As the opioid crisis has evolved, DHS has tried to respond. The emergence of the synthetic opioid fentanyl, which the U.S. Centers for Disease Control and Prevention says is 50 times more potent than heroin, represents the latest, and potentially deadliest, challenge, as law enforcement officials report it is being cut into opioids and other illicit drugs. That means individuals can be exposed to fentanyl, and thus face a high risk of overdose and possibly even opioid addiction, without even knowing it. DHS launched a pilot program in late 2018, as part of a needle exchange program at the AIDS Resource Center office in Milwaukee, to provide education about fentanyl and testing strips to users so they can test for the presence of the synthetic opioid in whatever substance they are taking. The idea behind the program, which could be expanded if it proves successful, is to prevent overdoses and change behavior, Krupski said. While all of the initiatives will take time to make much of a dent in the opioid epidemic, Krupski remains hopeful. “I’m really confident that with the commitment we have ... we are moving in the right direction and we will turn the tide and start seeing changes,” he said. Already, preliminary reports suggest 2018 opioid-related deaths in the state may have declined for the first time in two decades, Krupski pointed out. L.E. Phillips-Libertas and New Season both focus on medication-assisted treatment supplemented by counseling and education — what Krupski described as the “gold standard” of treatment. “We offer a very robust, comprehensive program that covers all aspects of a patient’s life,” Simonson said, noting that patients can get inpatient treatment at L.E. Phillips-Libertas or outpatient treatment at the Prevea Medical Services building in Chippewa Falls. In response to the continued rise in opioid abuse, the Prevea network added the Chippewa Falls clinic in September and soon will add outpatient medication-assisted treatment for opioid use disorder in Eau Claire. The facilities use Suboxone and Vivitrol in their treatment. Suboxone, a controlled opioid, prevents people from getting high while also preventing cravings for opioids, while Vivitrol also reduces cravings and blocks any pleasurable feelings with a monthly injection. Without the medications that prevent cravings and reduce withdrawal symptoms, many people relapse and abandon their efforts to halt their addiction. The methadone that most New Season patients receive also is an opioid, but it is delivered at a therapeutic level that reduces the risk of overdose and also has a blockade effect that prevents the user from feeling euphoria if they use any other opioids, Poehler said. Initially, patients are required to go to the clinic every day for their medication before eventually being allowed to take prescriptions home — subject to random drug screenings and medication supply checks to ensure they aren’t misusing their methadone. The clinic, which had about 100 patients at the end of 2018, generally treats as many patients as allowed based on its number of counselors. “There are not enough programs to treat all the patients, and there is also a pretty significant counselor shortage,” Poehler said. While a majority of the clinic’s patients are on Medicaid and thus have their services covered, others grapple with affordability issues if they don’t have health insurance or their treatment isn’t covered by their policy, she said. Mayo Clinic Health System also has a number of physicians certified to treat addiction patients with Suboxone, said Dr. Terrence Witt, a family practice physician in Eau Claire who is a member of the Mayo Clinic Opioid Stewardship Program’s steering committee. The group was formed to establish safe prescribing standards for opioids, and its guidelines have led to a significant decline in the number of opioid prescriptions written — an important development considering Witt said the vast majority of his patients who are addicted to heroin have indicated their addiction started with a prescription painkiller. The patients typically move to street acquisition of narcotics, heroin or fentanyl-laced drugs after their prescriptions run out — a pattern that officials report has been repeated across the country. A key hurdle to helping opioid-addicted patients is getting them to recognize they need treatment. “Probably the most significant challenge is getting patients to take that step,” Witt said. Once they do, often despite relapses and other bumps in the road, treatment providers said the results can be life-changing and even life-saving.